In a process called benficiation, many mine mouth processing plants crush and grind the ore to very fine particles. 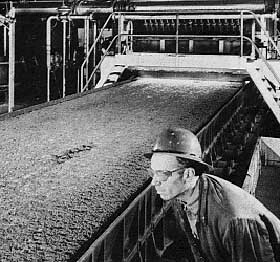 These iron rich fines are then separated from the rock either magnetically or by flotation and made into pellets a process called pelletizing. At the iron and steel plants, fines are recovered from ore handling and from the blast furnace itself. These fines are partially fused and then broken up into a uniform size in a process called sintering that allows the material to be fed into the blast furnace.